G.Skill had announced new DDR3 Dual Channel kits under the RipjawsX series that have been specifically engineered for the Sandy Bridge platform. Apparently these new modules go upto 2300 Mhz at CL7 on 1.65v! Now that’s FAST! A whole range of performance memory for any Intel Sandy Bridge system, up to and including the incredible RipjawsX 2,300MHz CL7 4GB (2GBx2), 2133MHz CL8-9-8 4GB (2GBx2) and 2,200MHz CL9 16GB (4GBx4) kits. Taipei-Taiwan-3rd January 2011. G.Skill has announced the development of its brand new RipjawsX series memory modules, designed specifically for Intel Sandy Bridge LGA1155 processors, and H67 and P67 motherboard platforms. The new RipjawsX series consists of a complete range of memory solution, from DDR3 1,333MHz, 1,600MHz, 1,866MHz, 2,133MHz, 2,200MHz to 2,300MHz. Combined with the Intel’s highly anticipated Sandy Bridge platform, G.Skill RipjawsX series memory kits deliver more bandwidth and performance than ever. The following screen shows ultimate 25K MB/s bandwidth at extreme memory speed of 2300MHz CL7. Building on the strong success of the first generation Ripjaws brand in performance memory kits, every single RipjawsX memory kit is hand-tested on an Intel Sandy Bridge platform in accordance with G.Skill’s strict internal testing procedure, to ensure the best in class performance, compatibility and reliability across a range of popular motherboards. It is the perfect memory solution for PC gamers, performance workstations, enthusiast power users and anyone who loves the cutting-edge of technology! 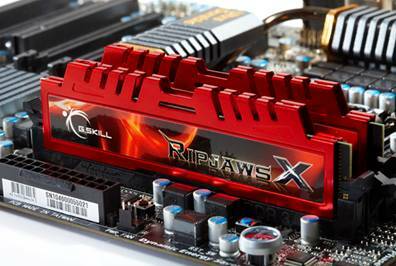 The following list shows the detail specifications of G.Skill RipjawsX family.